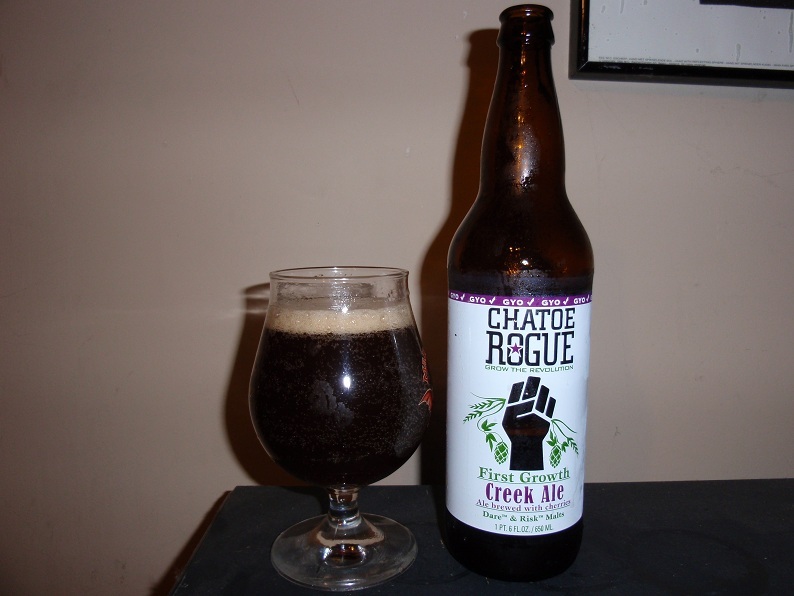 Today I have the 5th and most recent ale from Rogue Brewing’s Chatoe Series of BYO certified beers. Creek Ale as you may guess is their interpretation of a Belgian Kriek, which are brewed or blended with Cherries. This bottle has been brewed with Wheat, First Growth Dare & Risk Malts, First Growth Revolution Hops, Montmorency Cherries, Pacman & Belgian Yeasts. Pours a very dark reddish brown hue. One finger of off white head is produced and fades within a minute. Smells strongly of dark pitted fruit esters from the malt, mostly plum and a bit of cherry, earthy yeast esters and some malty sweetness. In the flavor you finally get more of the cherry esters as well as some notable plum and gentle grape, clean wheat and barley esters, some malty sweetness and gentle tartness from the cherries. As the brew warms the caramel character of the malt starts to shine through and compliments the variety of fruity esters very nicely.Â Body is medium and the mouthfeel is very clean for the style leaving your palate quite refreshed. Coming in at 6% ABV this ale is an easy drinker.Â An enjoyable brew with a variety of pitted fruit esters Â but not a lot else. If you enjoy simple, fruity, dark Belgian Style Ales this might just be the beer for you. Give it a shot and ride your bike.